Moving your pool table with San Diego Pool Table Movers in California includes professional tear down, transportation with expert leveling and installation of the existing pool table cloth. We handle everything from start to finish. We provide pool table services and repairs also in National City, Chula Vista, Bonita, La Mesa, La Presa, Spring Valley, Imperial Beach, El Cajon, Rancho San Diego, Santee, Bostonia, Lakeside, Barrio Logan, South Park, Five Points, Coronado, Mount Hope, South Crest, Old Town San Diego, Carlsbad, and many other areas all over southern California. The San Diego Pool Table Movers can recover your pool table as well with new material if you desire for an additional cost. Guaranteed satisfaction and leveling on applicable pool tables. We can move pool tables from house or house and we service local businesses also. We move pool tables in homes, businesses and even garages! 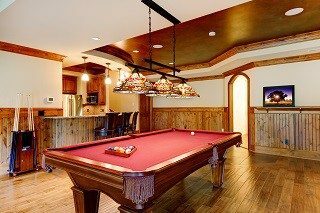 We handle every aspect of a pool table move, including proper teardown and a professional pool table installation. Other services include in-home moves, proper breakdown, and safe transport to storage, professional pool table setup, pool table recovering of an already installed table and moves in two appointments for when you need your floor carpet replaced. Please note that when moving a pool table we offer new cloth to recover at the time of installation. This happens to be the best time to take care of the pool table recovering service since the table is in pieces, so in case you’re considering to add new cloth at the time of installation or just a good old refelting service because the felt worn out and needs replacement, let us know in advance and we will have the material ready in your desired color. Our professional pool table installers work with standard woolen pool table cloth and tournament grade worsted materials as well. Also, if you’re not sure which size of table to pick, check out a chart we have put together with the proper pool table sizes to verify the pool table that will properly fit in the room where you want it set up. San Diego Pool Table installers is backed by the only national organization in our industry. Pool table moving in the San Diego California area includes professional tear down, transport and pool table installation with expert leveling. Members of the ABIA, the only company in San Diego California to offer you an exclusive 1-year service guarantee IN WRITING and issued by the American Billiard Installers Association. San Diego Pool Table Movers installs new and used pool tables all over the San Diego area. We come to your home, un-crate as necessary, cover rails and professional level all 3 pieces of slates using precise leveling equipment. 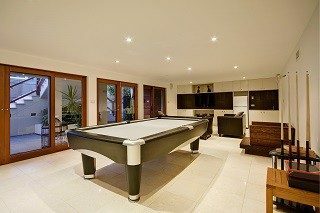 We think that it’s a good idea to take into consideration the room sizes, you can check on the pool table room sizes section before you move your pool table.